Striker Billy Waters says he feels like he is coming home after signing for the Cobblers from Cheltenham Town for an undisclosed fee. A quick peek at the 22-year-old’s history tells you he was born in Epsom and then progressed through the ranks of Crewe Alexandra as a youth, before breaking into the first team at Gresty Road. There is no mention of links to Northampton, but they are there. Waters spent a big chunk of his childhood living just down the road in Silverstone, was a member of the Cobblers centre of excellence, was once a mascot at Sixfields, and fondly remembers the day he watched footballing giants Manchester United take on Town in the FA Cup. “I know the area because I used to live in Silverstone, and I actually used to be in the Northampton centre of excellence before I moved up north,” revealed Waters. “So I am coming back to where I started. “I lived in Silverstone for about eight years before dad’s work took us elsewhere, but it is good to be back down here again. “I went to the infant and then junior school in Silverstone, and I had a really good childhood growing up there. “I was also at Northampton’s centre of excellence for a couple of seasons, I came to a few of the games, and was a mascot once as well. “I watched the famous Manchester United game too, my mum had to queue for about three hours to get tickets! Indeed, once Waters was aware the Cobblers were interested in signing him then he admitted it was the place he wanted to be. After winning four different player of the year awards at Cheltenham last season, and finishing as the Robins’ 16-goal top-scorer, Waters was a man in demand. A clutch of clubs were reportedly chasing his signature once it was clear the player wasn’t going to sign the contract offered to him at Whaddon Road, but his sights were set on Sixfields. “My agent gave me a call the other week and told me Northampton were interested in me,” said Waters, who was reportedly also on the radar of Plymouth Argyle as well as newly-promoted Lincoln City and Forest Green Rovers. 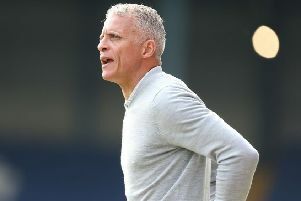 “Straight away, that was appealing because it is a league one team, and the club seems to be going in the right direction. “I met Justin Edinburgh and he sold the club to me, and it just felt like the right move, to move up a level. “That was what I wanted at the start of last season, and I am delighted to have signed. “Northampton got a promotion the season before last, and it just felt the right club to come to. Cheltenham Town boss Gary Johnson and the club’s supporters will be disappointed to have lost a player that was clearly so well liked and admired in Gloucestershire, and Waters admits he loved his time there. But he says he is an ambitious player, and that he simply had to take the chance to better himself offered by the Cobblers. “I have loved the past two seasons at Cheltenham, and it will be a club I will always love,” said Waters, who has signed a three-year deal at Sixfields. “But when the opportunity to move up a level comes, as a player you have to take that, and I don’t think there will be any bitterness from Cheltenham, as I am sure they respect that.